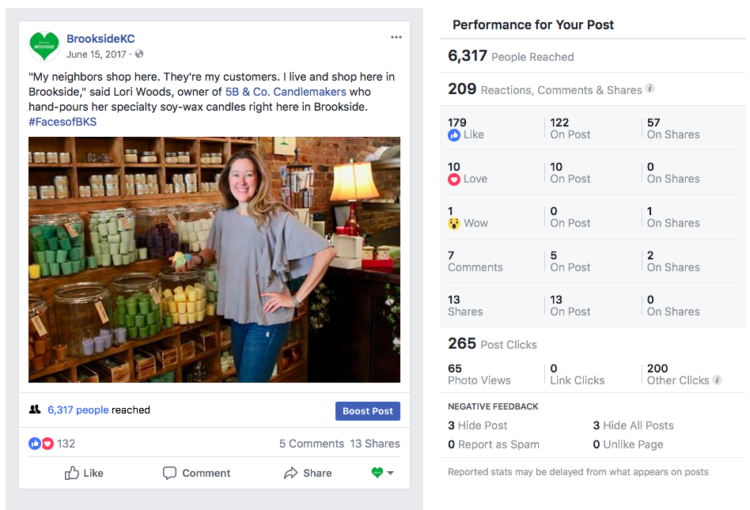 Case Study: Faces of Brookside, 2018 Gold SMCKC AMPS Winner! 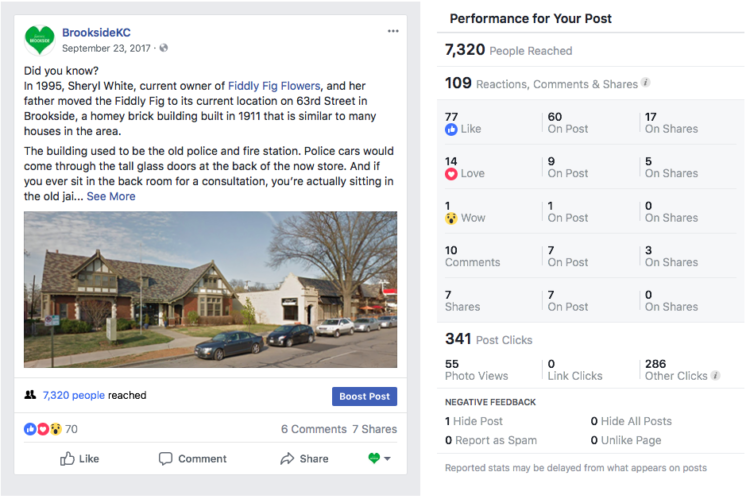 This campaign is ongoing and was a 2018 Social Media Club of Kansas City AMPS Gold Award winner for both a real-time campaign and Facebook Campaign in the Government Entity category. The Brookside area is home to married couples with kids and a bustling household, or young millennials who have recently settled in this beloved Kansas City neighborhood. Brooksiders love Brookside. They’re champions of all things local and enjoy the charm of their neighborhood shops, often befriending shop owners. There’s a history of the community in this little neighborhood and that is the secret to its charm. OBJECTIVE: In the midst of a changing retail scene, Brooksiders have held onto their pride in local business. 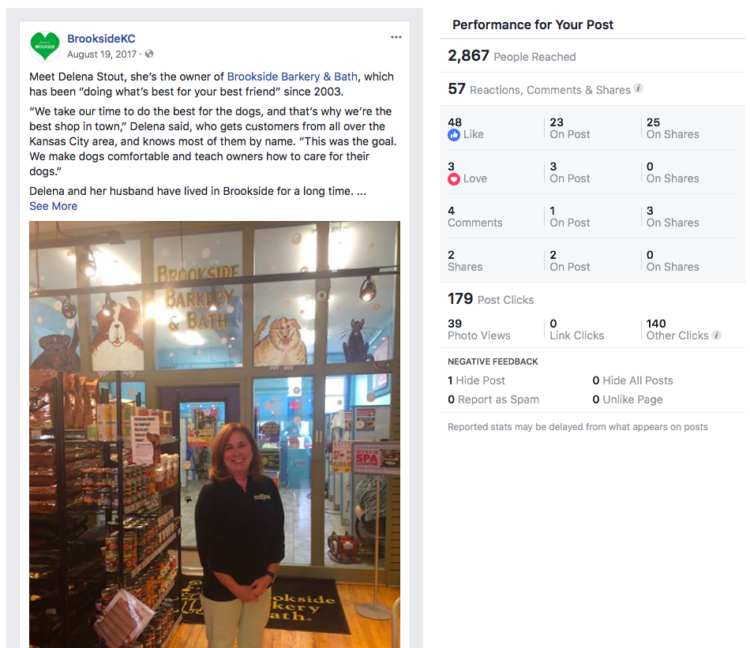 This ongoing campaign aims to increase awareness of Brookside as a local business retail and services destination by promoting the local brand of Brookside and showcasing the Faces of Brookside. These hard-working business owners love the area and are often working daily in the shops themselves, talking to customers and shelving new product that they personally curated. Small business is a labor of love and we wanted to show the hearts behind the storefronts. STRATEGY: The strategy was simply to combat Brookside residents’ and business owners’ fears of losing the local heart of Brookside by showing the faces behind Brookside’s beloved storefronts through sharing the business story and passion of Brookside CID business owners. 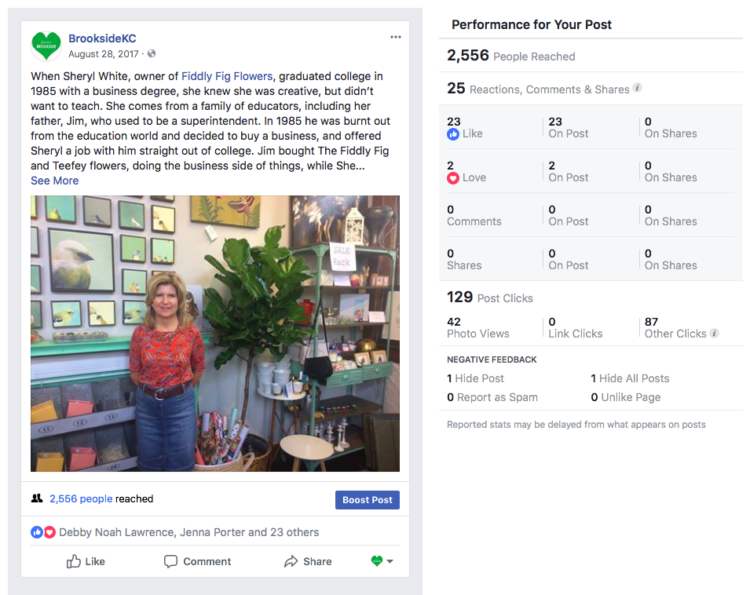 We do this through compelling storytelling through interviewing a business owner once a month, learning about their business and their heart behind it, taking photos, and then sharing them in a story-driven format on Facebook and Instagram. KPI: We were hoping for over 1,000 in reach, but numbers and responses soared. 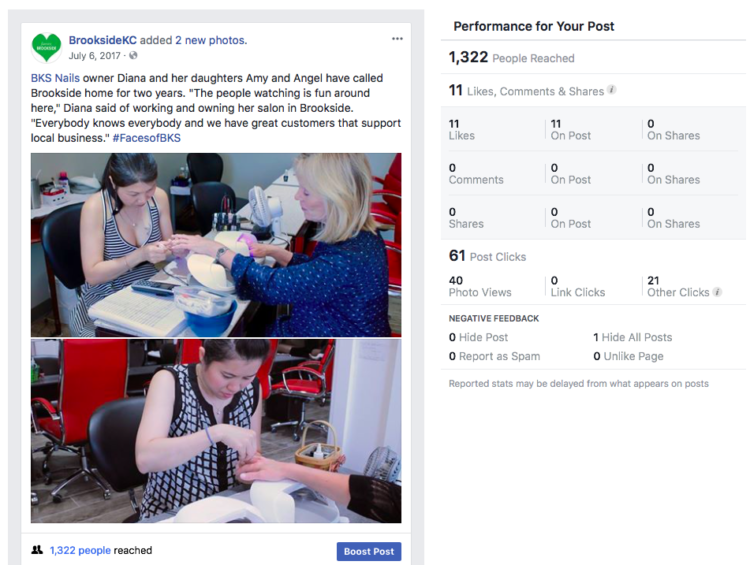 Followers loved and engaged with the content and continue to share and comment. ALL ORGANIC: No posts were promoted for this campaign, all results are organic. The results of the Faces of Brookside campaign took on a whole life of their own, showing a thriving, championing community of local support. 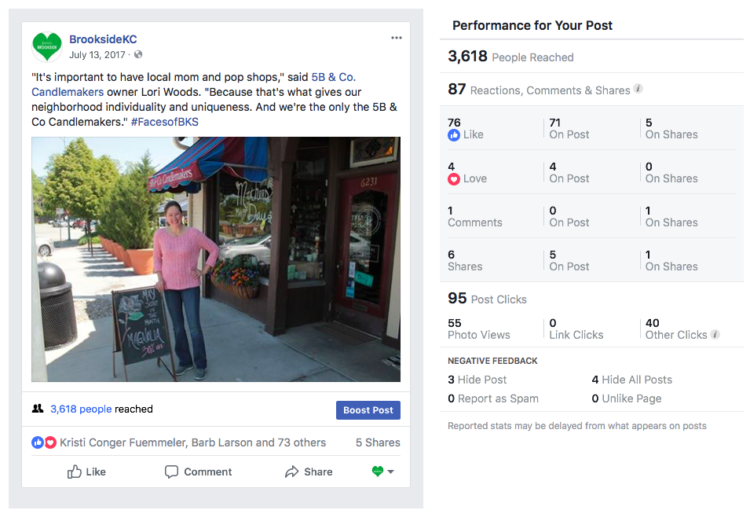 Business owners feel encouraged when the responses online overflow with devotion to their store, and the outpour of sharing and engagement allows new followers to see that their friends and family value shopping local. The average post reached over 2,000 users, made over 4,000 impressions and engaged 115 users. 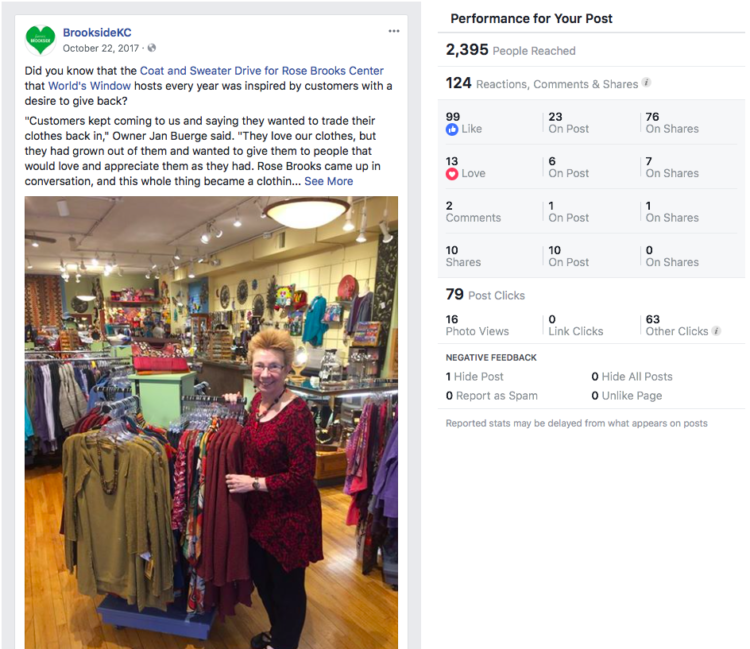 Our Faces of Brookside posts continue to be the top performing posts every month as followers praise their favorite business owners and shops and share and like content. 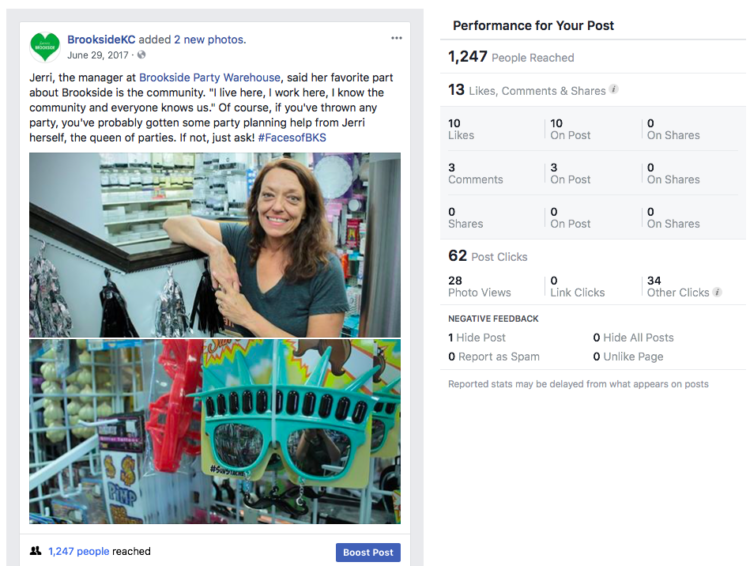 Throughout the 2017 campaign, we earned 24 shares, 395 likes, and 23 comments. Reach totaled 26,676, impressions 46,647, and 1,260 engaged users, with 1,034 post consumptions. Lifetime post total impressions reached 46,647 users.